Asparagus, the first of the spring vegetables, these tender shoots are a sign the spring is well on its way. I'll be sharing two of my favorites. First marinated then grilled and the second is in a spring frittata. This season has been a little odd with that heat wave in March followed by a droughty cooler April. Throw in a couple nights with frosty mornings and asparagus has been touch and go here in northeast Indiana. That hasn't stopped me from devising ways to enjoy it with other locally available ingredients. Somehow, limited availability only makes asparagus that much more desirable. The first thing to do when preparing asparagus is to cut off any woody ends. 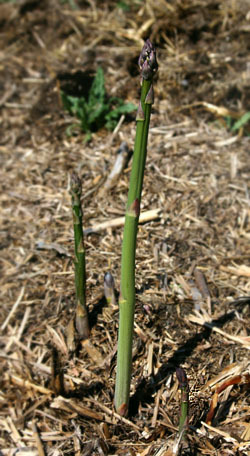 Asparagus gets woody when it is stored too long, dries out or experiences too much drought and wind in the field. There is some debate over whether or not snapping works. I find it works for me, so I use it. That's why the ends of my asparagus look ragged. To use the snapping method, simply work your way up from the base of the asparagus until it snaps rather than bends. I've also heard of folks pealing the bottom two inches of the stocks with a vegetable peeler to remove any woodiness. If you feel like you are wasting valuable food by discarding the ends, freeze them and use them in future stock or soups. Now that the asparagus is trimmed on to the recipes. Grilling asparagus brings out sweetness by caramelizing the natural sugars. I skewer the spears to keep the asparagus from falling through the grate. I love these served with grilled hamburgers. I buy Hawkin's Farm beef patties which are from their grass-fed, pastured cattle. Top them with Sunny Meadow Farm Baby Swiss cheese, which can also be purchased at the Hawkin's Farm Store, serve on a wheat bun with sauteed onion and dehydrated cherry tomatoes and you have a spring feast you'll want to share with friends and family. Place your trimmed asparagus into shallow dish. Mix together the olive oil, balsamic vinegar and garlic then pour it over asparagus. Toss to coat. 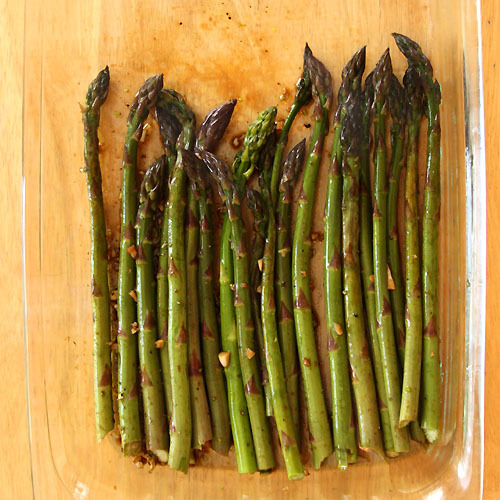 Allow the asparagus to sit at room temperature for about an hour before grilling. (You could also leave it up to four hours in the refrigerator any longer than that and you risk the balsamic vinegar over shadowing the asparagus flavor. 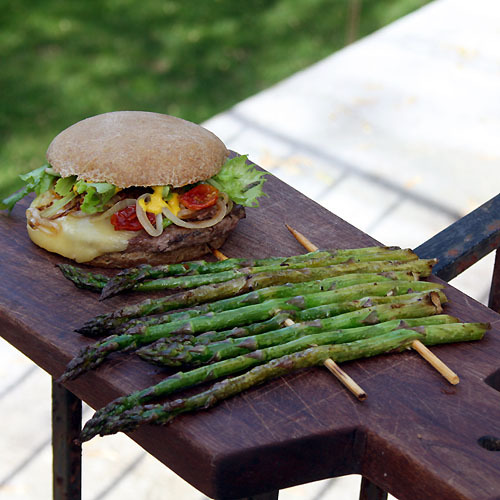 If you are worried about losing asparagus into your grill, thread it onto wooden skewers. Because this cooks so fast you don't have to worry about soaking the skewers. They might turn a little black but they won't burn. If you are serving the asparagus with grilled meat, do the meat first so that it has a chance to rest. 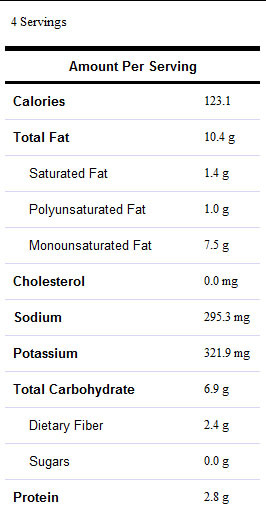 Asparagus only takes 6-8 minutes to cook. Place the asparagus on the grill over medium heat and cover. Turn after 4-5 minutes or when their color starts to darken and become a verdant green. Allow to cook another 3-4 minutes. Serve with a dash of salt and pepper. Enjoy! Frittatas aren't just delicious for breakfast and brunch, they also make delicious filling dinners. 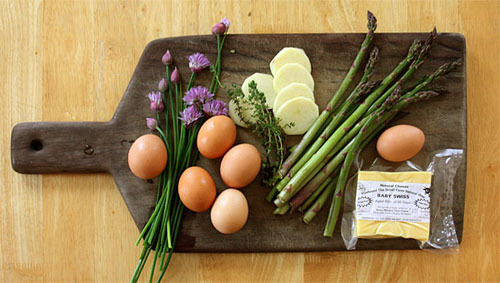 This frittata is loaded with asparagus, potato, Swiss cheese and thyme. It is a great way to showcase asparagus if you don't have a lot of it. We usually do egg as a main dish meal once a week. 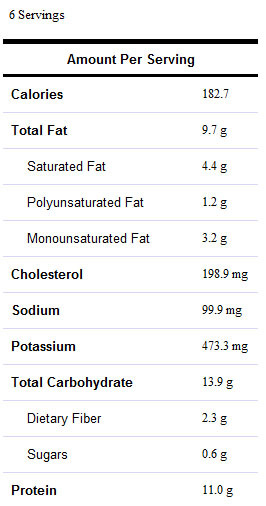 Eggs are an excellent, inexpensive source of protein. Plus everything but the potatoes are available locally this time of year. Hawkin's Farm Store also sells their amazing eggs. See the golden yellow color of that frittata? That's because the hens get to scratch and peck in the sun eating a diet rich in greens and bugs. Feel free to substitute sharp cheddar, goat cheese or any other strong flavored cheese in this recipe. One of the biggest problems with frittatas is that they get over cooked and the egg gets rubbery. Cook's Illustrated's New Best Recipe Cook Book suggests half cooking the frittata on the stove and then finishing it in the oven. It works like a charm. Just make sure you have a skillet that can go from stove to oven. 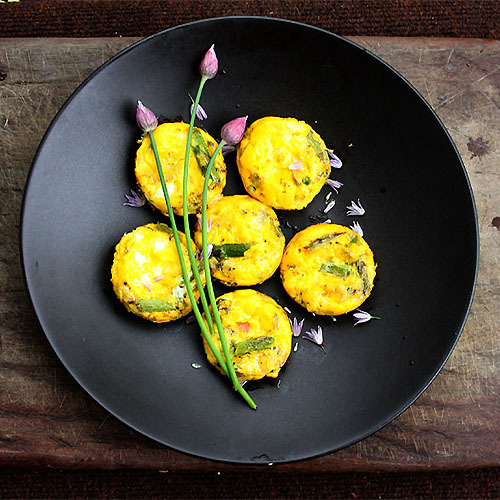 If you would like to make mini frittatas butter a six muffin tin and distribute the hot potatoes, asparagus and onion into the bottom before topping with the egg mixture. Then cook in the oven for 6-10 minutes or until the egg is set. Adjust the oven rack so it is in the upper middle position. Then preheat the oven to 350. In a 10 inch oven proof skillet heat the butter until foamy.Brown the potatoes in the butter. About half way through add the onion and asparagus. Mean while mix the thyme, salt and pepper into the eggs. Once the potatoes are browned and the onion and asparagus have had a couple minutes to start cooking, over the heat arrange the potatoes,onion and asparagus evenly in one layer on the bottom of the skillet. Pour the egg mixture into the skillet and sprinkle the grated Swiss cheese on top. Allow the frittata to cook a little until the edges start to set, about 1-2 minutes. Tilt the skillet to ensure the egg is evenly distributed. Pop the frittata into the oven for an additional 2-4 minutes or until the top is just set. Then remove the frittata from the oven and run a rubber spatula along the edge to loosen it then invert it onto a serving plate. Frittatas can be served warm, room temperature or cold depending on your preference. What's your favorite way to serve asparagus? This blog post was part of a great blog hop called Simple Lives Thursday. mmm...Love asparagus! We've been tossing it in oil and placing them directly on the grill with great results. That fritatta looks wonderful. I have never grilled asparagus and apparently I am missing out. It looks so good! I am going to have to try it! Yum! I love grilled asparagus - I think it's one of my favorite ways to prepare it. I have a grill basket, but love the idea of the double skewers to hold it in place too!! I trim asparagus the same way, it's definitely the best way! I haven't used the ends in any soups yet, but still want to try that out. Thanks your recipes, I'll have to try them out! Go asparagus! Love asparagus! All the food looks so delicious! Hmm...my favorite way to serve asparagus? I think my fav is the most simple: roasted with lemon, garlic, and sea salt. It's like eating chips! I love asparagus. I is my favorite. I love it grilled or sautéed with butter and garlic! It is very hard to come by here in Israel though. Sigh. 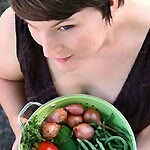 I really like the look of your site and the great information that you have on Asparagus. 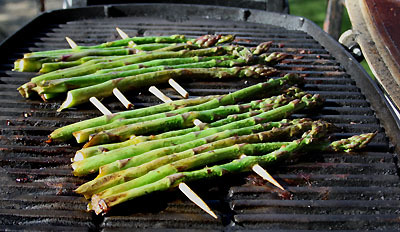 Asparagus is one of my all time favorites and I really liked your tip of doing them on the BBQ once they are skewered. We're growing asparagus in our garden for the first time this spring. Not sure if I should expect shoots now or if I must wait until the second season (we're planting crowns), but I'll come back to this page for sure when it's time to harvest some! We love asparagus. Thanks for sharing some recipes for us to try!